Reading the Fantastic Four comics from the start. 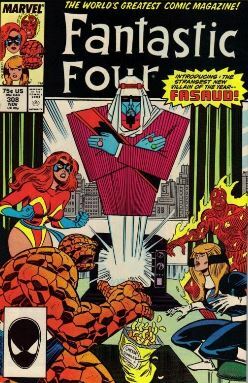 We’ve got the new team now — Ben, Johnny, Crystal, and Sharon (Ms. Marvel) — so it’s time for them to go up against a major villain. And what a villain this is. There’s no other way to say it: Fasaud is an Arab Max Headroom. He comes out of television and zaps you with electo-powers. So, yeah. An Arab villain is problematic. An Arab villain with blue skin is even more problematic. Less problematic is that this was years after Max Headroom was popular. Now that the Band-Aid has been ripped off, let’s continue. Fasaud is after Dunbar. He electrocutes the maid, giving her a second-degree burn, and then he vanished. Johnny uses his powers to heal the maid’s burn (! ), and then flies off to join his teammates. At Four Freedoms Plaza, Ben is locking up Reed’s lab, so that no one can mess with the potentially dangerous scientific wonders inside. Johnny shows up and tells everyone what’s happening. The team rushes to a CBS studio, where Dunbar is attacked by Fasaud. 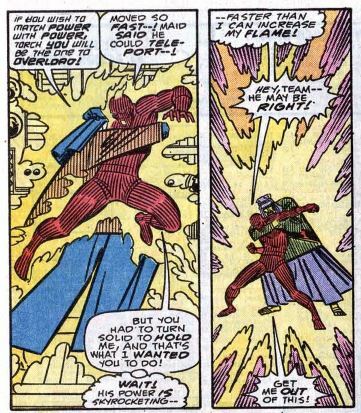 The FF arrive by crashing the Fantasticar through the wall (!). Everyone fights Fasaud. Can turn immaterial, so punches go right through him, and he can teleport around the room. Fasaud grabs Johnny, which causes Johnny’s power to increase, Johnny has to fly outside to unleash his nova flame in the open sky without harming anyone. Ben uses insulation from some cables as a weapon against Fasaud, which makes Fasaud disappear. Johnny unleashes his nova flame over NYC, but is knocked out. Sharon tries to rescue him, but freezes up because Johnny is a man, and she is reminded of the men who abused her in the past. Instead, Crystal uses her elemental powers to blow up a sidewalk hot dog cart (! ), creating an updraft of hot air to cushion Johnny’s fall. The fight over, everyone compares notes. Ben tries to be respectful of Sharon’s PTSD, but nonetheless plays the tough boss, telling her not to screw up again. Johnny and Crystal talk to Dunbar, who explains that we was recently in the Middle East, where he did a story about the wealthy and secretive Sheikh Farouk Al-Fasaud. Dunbar exposed Fasaud’s corruption, only for Fasaud to break into the TV studio and attack Dunbar. Fasaud clumsily stabbed a TV camera instead of Dunbar. 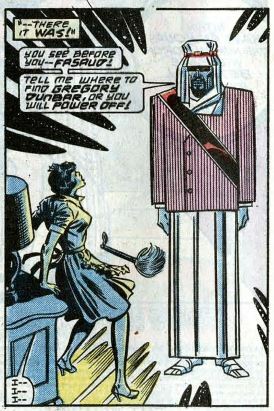 This gave him weird electricity/television-based powers. Ben decides to split up the team, with Johnny and Crystal staying behind to bodyguard Dunbar, while Ben and Sharon will travel to Fasaud’s home country of Aqiria to take the fight to the villain. 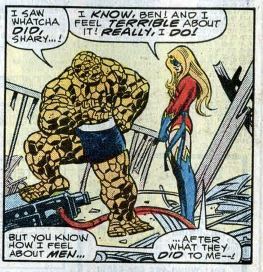 As the heroes fly off in the Fantasticar, Ben’s thinks about how concerned he is about Sharon, and how if she can’t handle it as a member of the FF, then that reflects on his leadership. Clobberin’ time: This issue is all about Ben’s leadership, and how he realizes how tough Reed had it trying to keep his teammates on track. Flame on: Johnny’s ability to heal burns appears to be new. He says he does it by drawing heat away from the wound, which I don’t think is how burns work. A later letters page will confirm that Johnny can only heal minor burns. Fantastic fifth wheel: There’s a bit where Crystal is interviewed by a reporter, and says she “couldn’t be happier” to be back with the FF. As for Sharon and her PTSD, things are just going to get worse for her for a long time before they get better. Four and a half: Franklin appears, wearing his Power Pack uniform, in this Marvel house ad for the X-Men books, which were so huge at the time that the ad doesn’t even have to say what its for. 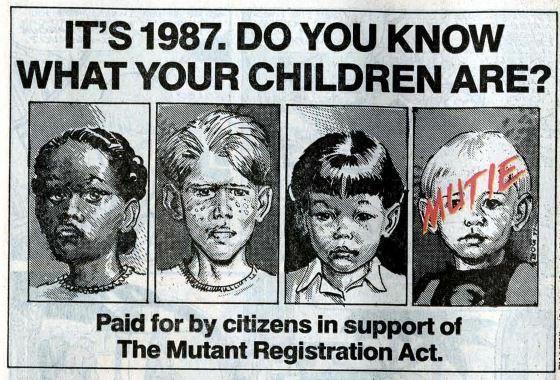 Trivia time: Part of this issue would later be recreated in the miniseries Marvels: Eye of the Camera, during its retelling of the Mutant Registration Act storyline. Fantastic or frightful? I can kinda/sorta see what they’re doing with Fasaud (this was the days of the OPEC oil scandal) and with the PTSD storyline. The ideas are good, it’s just that the execution is flawed, so that what began as an interesting idea becomes goofy and all over the place. Next week: Hop that fence!